Dan and I spent too much money eating out at boring places like Moe's and Panera, so we've resolved to cook more at home and instead indulge a few times a month at local eateries we haven't been to before. Recently, we were planning to go try the burgers at M.L. Rose, but it was jam-packed (and had a weird seat yourself policy) and had NO seats. So we headed to 12 South for pizza at Mafiaoza's, since a friend at work recommended it to me. 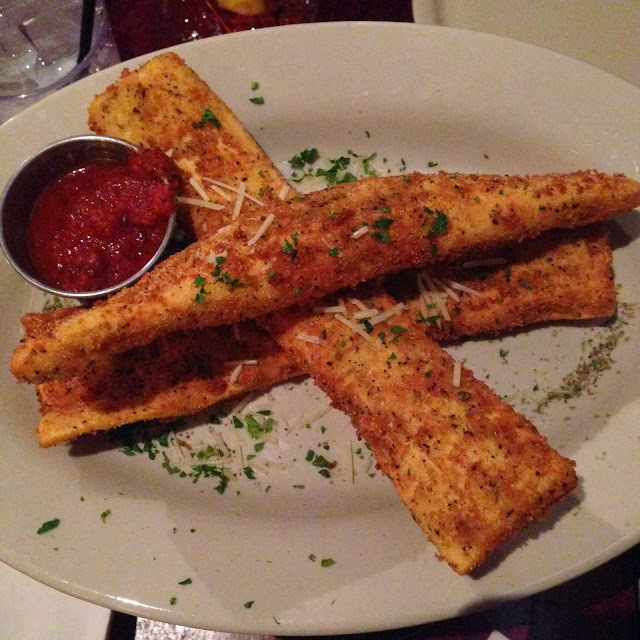 We started with the Fried Cheese Ravioli Sticks as an appetizer, which was delicious! They looked like breadsticks at first, but they had the great chewiness of pasta and melted delicious cheese inside. Let's just say I knew to pop a couple of Lactaids before this meal because I couldn't go to Mafiaoza's and not indulge in cheese. 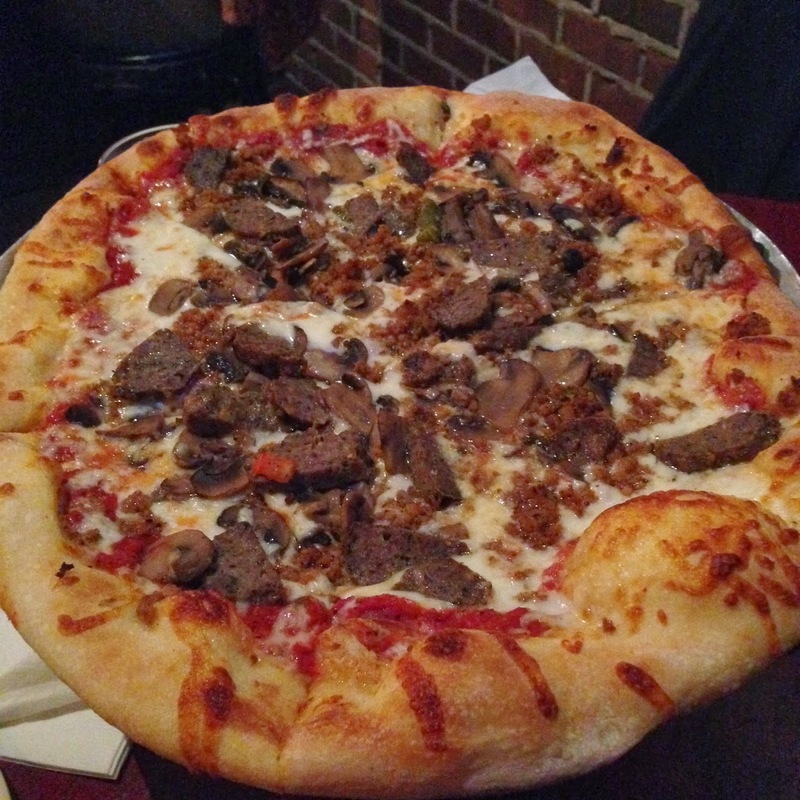 For our pizza, we selected The Fall Guy, which is a meatball and italian sausage pie. We added some mushrooms too. It did not disappoint! For us, a good pizza has to have good dough. Soft but chewy, with a good crust. Then it has to have a good sauce and cheese to tie everything together. This brick oven pizza met all the requirements, and the leftovers we took home didn't last 24 hours in the fridge. I would not hesitate to come back to Mafiaoza's for another pizza pie. 12 South is such a fun area to visit, so we'll be back for sure. i love 12th south! 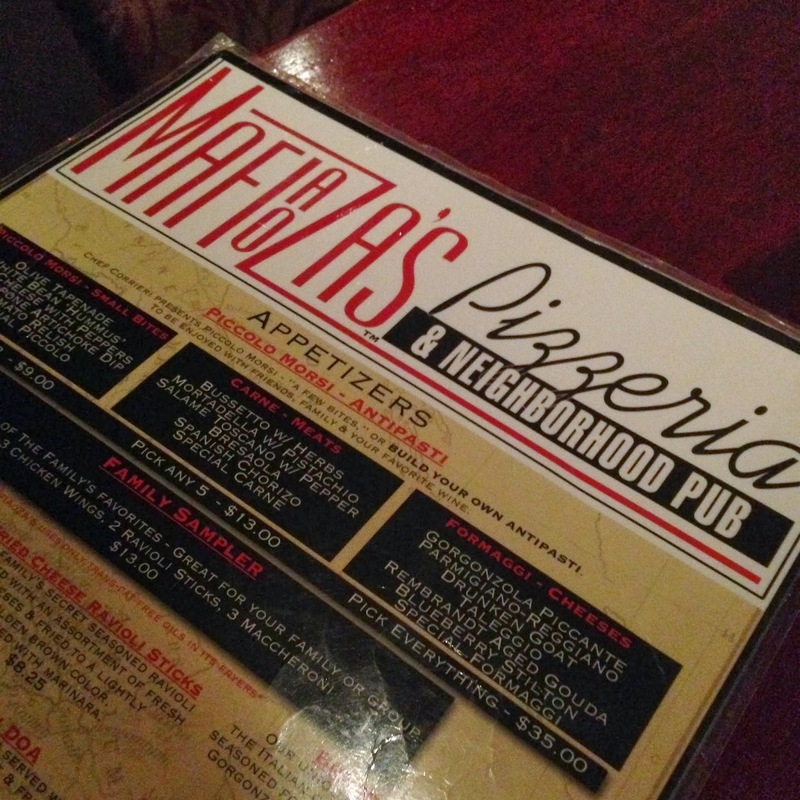 i went to mafiozas when nick's fam was in town once and shared the breakfast pizza with his brother— it was amazing! it had gravy instead of sauce, potatoes and sausage and peppers on it. . ugh i know i sound like a nasty person (breakfast pizza, what?!) but it was so effing good! hmmm, other places in the area to go if you run into another packed restaurant situation is Edley's BBQ (their pulled pork nachos omggg), and Sloco at lunchtime (their quinoa "meatball" sub is great!) are awesome and both on 12th. also, 12th south also has a jeni's now, however— Legato's Gelato is my go to for frozen treats and it's around the corner in edgehill village. their vanilla is somehow mind-blowing and gelato is super rich and served at a higher temperature soooooo no brain freeze! My college used to make breakfast pizza and I LOVED it. Whole Foods makes a good one too; sometimes my coworkers bring it to the office. YUM. I have an even better idea though: Jenna and Aubrey have a Legato's Gelato Friend Date!